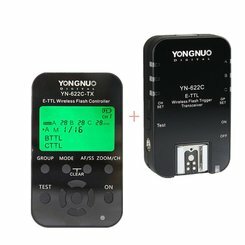 YONGNUO YN622C-KIT Wireless E-TTL Flash Trigger Kit with LED Screen for Canon includes one YN622C-TX Controller and one YN622 C Transceiver. The YN-622C-TX transmitter acts as a master control unit to the popular YN-622C E-TTL and Remote Manual transceivers, providing more functions and a far more user friendly built-in LCD user interface. Also adding a USB port for firmware updates, which is major advantage over the current triggers.